RootsTech, the tech/genealogy conference held annually, has launched their first annual photo+story competition: submissions are categorized into four categories: Connect. Belong. Family. Heritage. I wrote the following for the Family category. I look forward to reading all the other entries as well, which can be found under the #rootstech hashtag across all platforms. In this picture, I’m the baby held by my mom, who is six months pregnant with my younger sister. At this moment, my parents’ cars in a cargo holding, packed with all our belongings. A hospital in Newfoundland has recruited my dad and agreed to sponsor his six-year-old daughter, my older sister, still in the Philippines. 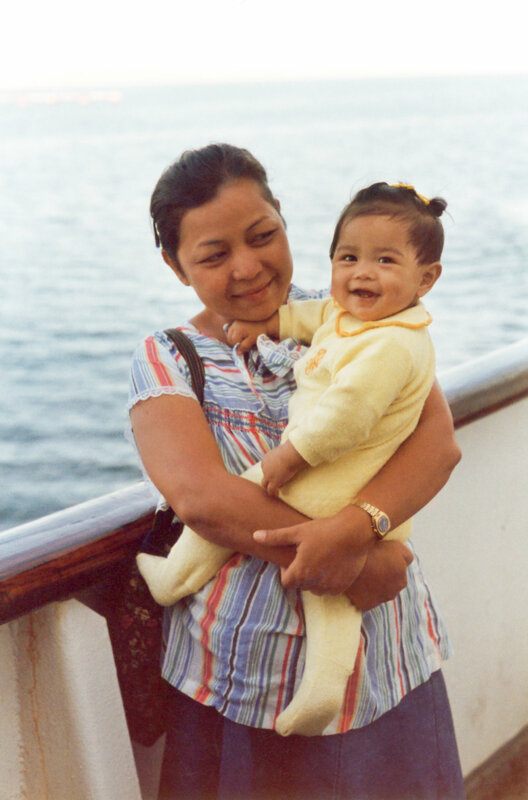 Initially my mom was left behind in the Philippines with my older sister. My dad and mom sent each other photos to tell the stories that each one was missing: my sister walking and potty training in the Philippines; my dad bundled up in his first New England snow. My dad applied to jobs all over the US, Canada, even Australia. This picture is taken at the edge of the journey, as we crossed over into Canada, where we could be reunited as a family.